Jonathan Hickman has written some excellent comics in his career, but with each new issue, East Of West continues to set itself apart from the rest of Hickman’s bibliography. His genre-bending, alt-history epic with artist Nick Dragotta, colorist Frank Martin, and letterer Rus Wooton is a consistently exciting, surprising title. The story’s combination of western, science fiction, and fantasy elements gives it a distinct perspective unlike anything Hickman has attempted in the past. East Of West is a different flavor, but it takes advantage of the skills Hickman honed during his eight years working in superhero comics. Working within the convoluted continuity of Marvel Comics made Hickman extremely comfortable telling densely plotted stories that gradually bloom over time, and he’s learned how to handle a sprawling ensemble cast by writing superhero team books like FF and Avengers. The Manhattan Projects continued sharpening these skills, but his first creator-owned ongoing allowed him to push his boundaries as a writer and think even bigger. Like his superhero books, The Manhattan Projects had Hickman working with established characters as he explored an alternate reality where the scientists of The Manhattan Project became the secret leaders of the United States. Even though his versions of real-world figures like Albert Einstein and Richard Feynman are drastically reimagined, they’re built on a foundation set by history. East Of West is Hickman’s first ongoing with a cast that is almost entirely original (with the exception of the biblical Four Horsemen Of The Apocalypse), and all that experience with continuity juggling and ensemble development has given this title an expansive line-up of characters with their own complex personal history tied to the equally complex history of the world they inhabit. That complexity doesn’t come at the expense of entertainment, though. Superhero comics require a certain amount of spectacle, action, and humor, and Hickman wouldn’t have had such a prolific career at Marvel if he didn’t understand those basic tenants. Those are a part of East Of West, and the series’ overarching narrative of warring nations and the coming apocalypse is more compelling because he has held on to those crowd-pleasing elements. Hickman has done a huge amount of work on the background of this environment and its inhabitants, but he knows that he doesn’t need to address all that in the main story. Having that background allows Hickman and Dragotta to make more informed creative decisions, which makes for a richer reading experience even if all the finer details aren’t given to the reader. In the case of East Of West, those finer details are provided in the East Of West: The World one-shot, an impeccably designed guidebook that significantly fleshes out the story. The World was published during the break between Books One and Two, and with Book Two ending in this week’s East Of West #29, another volume of The World would be welcome to help reorient readers after the major events of the last arc. So much has changed in Book Two as tensions between nations explode and the threat of The Message and the Horsemen grows, and the book ends with one of the most important moments of the series: the reunion of Death and his son, Babylon. After the explosive events of The Chosen’s final meeting, Hickman brings the scope of the story down to a more personal level for this reunion, concluding with an uplifting moment of relief as the father and son head into their apocalyptic future. Babylon is one of the most fascinating characters in East Of West; the son of Death and Mao Xiaolian (current premier of the People’s Republic) was abducted as a child and raised in a virtual reality that was molding him to become the Beast of the Apocalypse, and he’s currently roaming the country with Balloon, a devious artificial intelligence that is manipulating Babylon’s perception so that he continues his training. Through Babylon, Hickman has explored the concept of burgeoning self-awareness and independence in youth, and despite Balloon’s efforts to control him, Babylon is starting to veer from the lessons he’s been taught. Introducing his father to this dynamic complicates matters by adding a new authority figure to challenge Balloon’s “parenting”; the first panel showing Death and Babylon together has Balloon floating between them, foreshadowing the conflict to come. Hickman is best known for his intricate plotting and dramatic storytelling, but he doesn’t get enough credit for his sense of humor, which is highlighted in the first half of this issue when three doomed bounty hunters ambush Babylon and Balloon. The hilariously overwrought dialogue of Billy Blackgun is the main source of humor, and his bloviated posturing sets up a great moment of action comedy when Babylon’s boar companion Doctor Tusk gores Billy because he’s so preoccupied with screaming at his bounty. Before that moment, Babylon uses his spear to dislodge a boulder that crushes one of the other hunters before she can even make a move, and the hastiness of her demise (plus the Wile E. Coyote-esque nature of the death) makes it a little joke at the start of the action. Then there’s Psalm 137, the last remaining assassin-scientists of the Kabbalist Remnant. The idea of 150 prophets, rabbis, and priests volunteering for transcendence and getting turned into cyborg killers named after the 150 Psalms is very dark but also very silly. Even though Psalm 137 is not a comedic character, there’s a sense of humor in the concept that shows Hickman is having fun with the creative process. Dragotta’s design for Psalm 137 instantly makes him the most intriguing character of the bounty hunter trio, combining angelic and demonic imagery in the tattered wings and hoofed feet while incorporating the cylindrical, red-lensed head consistent across many of the mechanical beings in the series. The design implies a character born of both heaven and hell, and the mechanical elements give it a cold, soulless appearance that suggests there’s no hope for the person buried deep within the Psalm’s shell. Hickman has found an ideal collaborator in Nick Dragotta, who is able to realize the writer’s ideas with smooth style and crisp detail that energize the narrative. 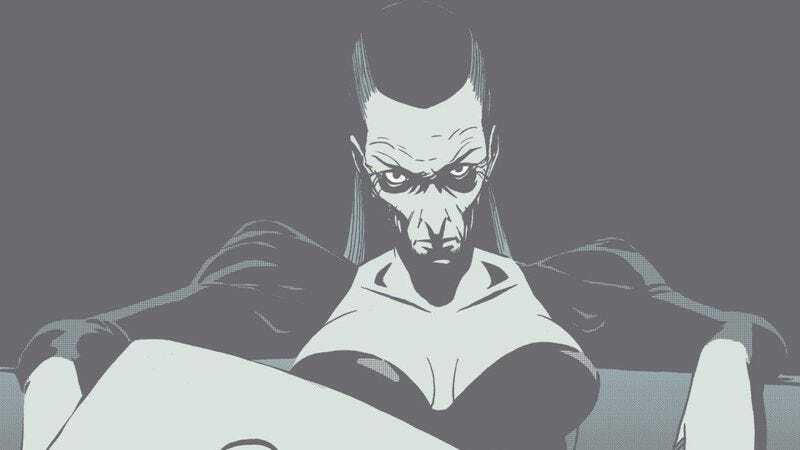 The various genre influences on the story give Dragotta the opportunity to pull from a range of visual aesthetics, and melding the look of a Sergio Leone western with that of a Katsuhiro Otomo sci-fi story has given East Of West’s visuals a bold attitude that makes Hickman’s story even cooler. His design work is striking and specific, as evidenced by his extremely clever interpretation of Babylon. Visual signifiers connect Babylon to a more traditional design for a young boy character—he wears a small backpack, the long brim of his helmet evokes a baseball cap, he walks around carrying a balloon—but his look is dictated by a sci-fi sensibility that gives him an alien quality, particularly with the covered eyes limiting his expressions. Frank Martin uses a limited palette in this issue, largely sticking to reds and blues with minimal contrast within the panels. Blue is the dominant color to emphasize night, and Martin uses red and orange to indicate when the reader is seeing Babylon’s Balloon-manipulated perspective and to highlight major moments in the action. That stark red and blue contrast ultimately makes the final scene hit harder when the sun begins to rise, bringing with it a change in the palette to represent the new start of Death and Babylon’s relationship. The dawn comes immediately after that hug, and the issue ends with a dreamy shot of father and sun riding side by side during the golden hour, closing Book Two with a visual of beauty and hope. It’s a moment of comfort before what is sure to be a brutal Book Three, and this respite from the doom reveals East Of West’s heart. In the midst of all the genre craziness, this title is telling a powerful, personal story about one man’s quest to bring his broken family back together, and focusing on Death and Babylon’s relationship in this chapter strengthens the book’s emotional foundation as it prepares to raise the stakes even higher.